I have made variations of this recipe for years now and have always received positive feedback. 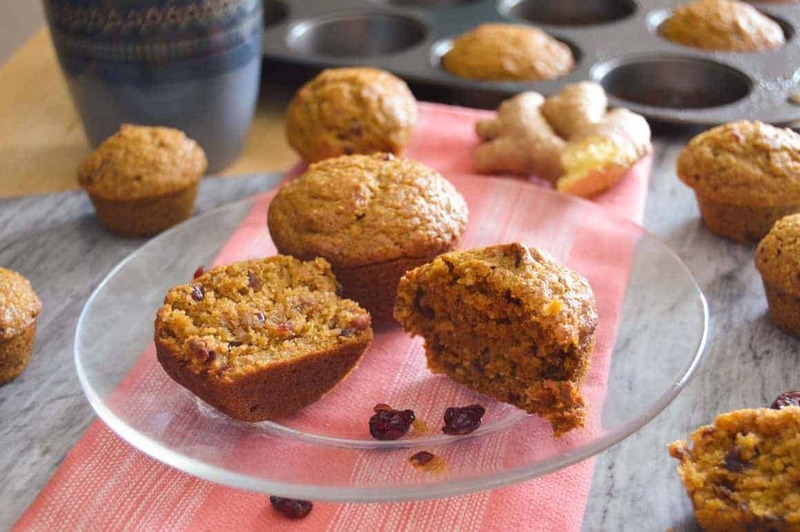 They’re my staple muffins to make around the holidays for friends, neighbors and family. I love making them for people because I always get a smile back upon first bite. They might be a treat as most muffins are, but they’re better for you than most muffins you buy in the store, I guarantee it. They can be enjoyed as a treat or as a breakfast side. I don’t know about you, but I love this time of year when things are cooling off, the mad heat of summer has waned and we can put on cozier clothes and watch the world around us morph. Pumpkins start popping up all around us….in stores, businesses, schools and on the front steps of homes. Their lovely orange color complements fall with the transforming outdoor scenery. Pumpkin puree has great health benefits besides making those fall treats taste great. It’s full of nutrients benefitting immunity, fiber-rich and great for skin, just to name a few. You’ve all most likely heard of the great benefits of ginger, but have you really baked or cooked with it much? If you’re not accustomed to cooking with ginger, start experimenting with it more. It’s not expensive at all to buy it by the actual root and fresh is best with ginger for sure, when feasible. It’s a glorious truly natural flavoring with so much good to benefit health. It’s health benefits are just the bonus to the outstanding flavor it adds to food. So, if you haven’t grabbed that funky looking root from your local store, find it and grab it next time you’re walking through the produce section and start playing with it. Peel away that outer thin layer with a knife and grate it up to add extra zing to homemade teriyaki, extra flavor to meatballs or add real flavor to some delicious moist muffins in this recipe. I have a habit of adding ground flax seed to many things I bake, except for cakes and pies. I love the stuff because I know it’s good for you, but the best thing about it is that you simply can not taste it at all, especially if you’ve already got a flavorful baked good. So, even if you’re leery of flaxseed because you haven’t baked with it before, this is a great recipe to try it out in. No one will know it’s in there, I promise! 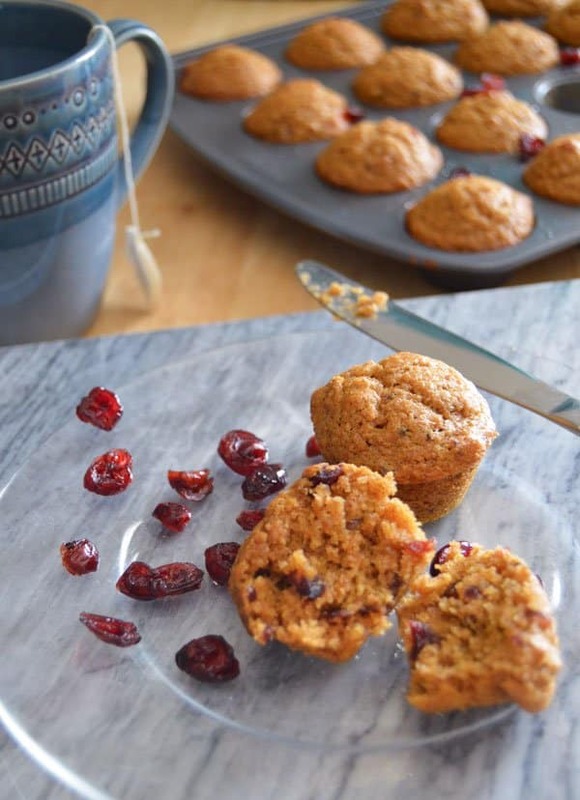 This time of year also naturally brings about a craving for cranberries and what better way to fulfill that crave and feel festive than adding cranberries to some moist muffins. Now, I personally do not recommend grabbing that bag of “craisins” you’ve had sitting in your cabinet to make these, but they will work of course. Those craisins are full of added sugar, so I’m not a fan. I prefer using unsweetened dried cranberries which are sold in bulk in some grocery stores. I will admit it is not easy to find unsweetened dried cranberries. I’ll have to start drying them myself soon I guess. When I make muffins at home (which is not that often) I always double the recipe and bake up a batch of regular sized muffins for adults and mini muffins for the kiddos. Besides this being an easy way to discern between the muffins adults can sneak (i.e. my husband), it is also a great way to treat the kiddos. It’s also great for portion control, plus convenient if you have more kiddos coming over to play. Also, who doesn’t like anything mini, I think adults secretly like mini food items even though they may not admit it because they feel like they’re being “good” eating something smaller than normal, yet not feeling deprived because they can eat more in quantity. This recipe makes 12 Regular sized muffins or 24 mini muffins. They are best served slightly warmed. This recipe easily doubles for a crowd and can be made ahead of time. They can also be frozen and defrosted in room temperature. This recipe was adapted from a Cooking Light recipe. Measure out and add all dry ingredients, flour through ground cloves to large mixing bowl. Mix well with whisk. Set up standing mixer. Add pumpkin through fresh ginger in mixer bowl. Beat ingredients at low speed until well combined. Once pumpkin mixture well mixed, slowly beat in dry flour mixture, about 1/2 cup at a time. Fold in chopped cranberries and combine with spatula. Place muffin liners in muffin tin and lightly spray liners with olive oil. Spoon batter full into muffin liners with a spoon. Bake 25 mins. Check largest muffin in center with toothpick after 20 mins as baking varies with elevation and ovens. They should also spring back when touched on the center. Remove immediately from pan and place on wire racks to start cooling. I gently use a butter knife or fork to help me get them out of the pan. Sample while warm and enjoy! Lightly spray muffin tin with olive oil. No need for liners with the minis. Bake for 15 mins and check doneness with toothpick. Add on a minute or two of baking if needed. Overbaking will dry out these little cuties. Give these minis just 5 minutes to cool on a wire rack before pulling out of pan onto wire rack. Katia, these muffins look absolutely delicious. Muffins are one of my favorite baked goods to make for my family. 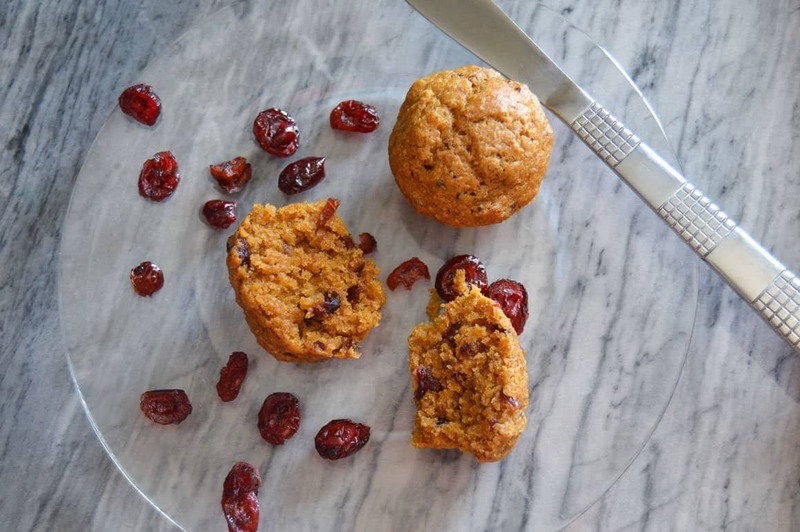 I like the idea of dried cranberry and pumpkin together. Thanks, Neeli! I hope you give them a try.